Aboard Silver Discoverer, embark on a 16-day ‘Photo Expedition Voyage’ to the remote Sub-Antarctic Islands of New Zealand, featuring special guest, David Wright, a highly acclaimed and award winning photographer. 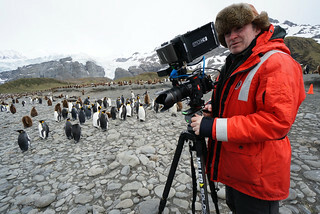 Wright has over 25 years of professional experience and has been awarded an Emmy and a BAFTA for his work, and has also worked with the BBC, National Geographic and Discovery Channel. Hosting several workshops, David Wright will show guests how to get the best out of their camera equipment and demonstrate professional photography techniques. Guests will also have the opportunity to join David on photography walks and Zodiac tours. Departing Dunedin on 22 December 2014, Silver Discoverer will sail through the beautiful bays of Akaroa, home to the rare Hector’s dolphin, before continuing to the Kaikoura area, where guests will learn about the traditional Māori culture. Journeying to the top of the South Island, guests will explore Nelson, New Zealand’s sunshine capital and home to some of the region’s best vineyards. Christmas Day will be spent in Picton, a picturesque seaside town that links the main islands of New Zealand, before cruising to New Zealand’s Fiordland National Park. Using Zodiacs to explore the Milford and Dusky Sounds, guests will encounter dramatic waterfalls and abundant wildlife, including penguins, seals, dolphins and the occasional visiting whale. Silver Discoverer will then visit the Snares, a near-pristine group of Sub-Antarctic islands, before staying overnight at Enderby Island and Auckland Island. This area is the primary breeding ground for the most endangered sea lions in the world - the New Zealand sea lion - and is also renowned for its diverse seabirds, namely the rare yellow-eyed penguin, bellbirds, red-crowned parakeets, and Gibson’s albatross. The next port of call is Australia’s sub-Antarctic jewel, Macquarie Island, a World Heritage site. Guests will enjoy an overnight stay on Macquarie Island, which lies halfway between New Zealand and Antarctica, and is home to thousands of seals and millions of penguins. Silver Discoverer continues her voyage to Campbell Island, an uninhabited World Heritage site, farmed since 1894, before visiting Ulva Island. This voyage concludes in Dunedin, with guests disembarking on 7 January 2015. Prices are per person starting from AU$16,150 in an Explorer Suite, double occupancy. Silversea Expeditions’ fares include: all shore and Zodiac excursions hosted by an expedition leader; complimentary parka; all-suite accommodation with butler service; gourmet meals with menus inspired by Relais & Châteaux; complimentary wines, Champagne and spirits served throughout the ships; and all gratuities.